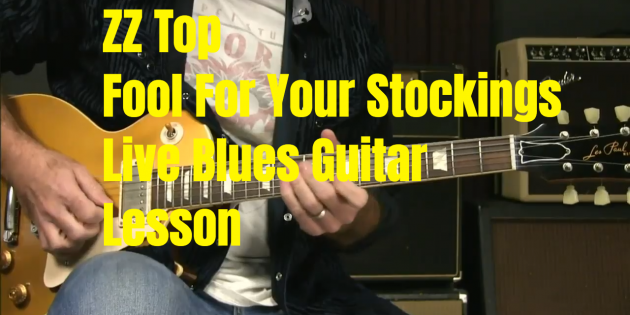 In this video I wanted to talk about ZZ Top’s “Fool For Your Stockings” chords and form. It’s a great set of chords that is basically a minor blues, but it has a fun turnaround. Most importantly, you see dominant 11 chords in this, and you just don’t see those very often so I wanted to mention them here so you can see how they are played (they are very easy) and how they might be used. Griff,bI live in Leechburg, PA Take care. Marty. Oh, how do I talk to you on Facebook ? Hi. I HV been playing since 1966 I now have neuropathy and can hardly use my pinky. Do you think that is feasible to play most chords and leads without the inability to play chords. Thanks Teach ! It takes a bit to get use to using the looper ! very good Griff I really dig this kind of lessons..
Hey Griff, thanks again for your insight and generosity. VEY COOL. THIS IS GREAT FOR A SLOW BLUES LOVE SONG. I THINK I WILL STEAL THIS AND CAHNGE A BIT AND WRITE A NEW SONG. STAY HAPPY GRIFF, THANKS BROTHER. Very good lesson on overdubbing into a looper with the bonus of that great chord progession. A twofer! Thanks man! Is a dominant 7 chord the same as maj7 chord and is the dominant 11 chord the same as a maj7 with the #11 added? Can anyone help me? No, a dominant 7 is NOT the same as a Maj. 7. Dominant 7, i.e., D7 has a flatted 7th (1 whole step lower than the octave root). Maj. 7 has a Maj 7th (1/2 step below the octave root). In addition, 11 chords are dominant 7th with the addition of the 9 and 11, not #11. Superb little lesson Griff…. I just love it how you lay it out in such a simple and straight forward way. When I first heard this song it felt “out of reach” but you closed the gap. Again, thank you. Yeah but can old bluesmen learn new licks? Love your jams, just bought your beginners blues and your intermediate lessons.I been doing your lessons on line, i live all your lessons their ggreat. They say old is can’t learn new tricks, well they are wrong. I will be 61 soon and I learned from you; but I still have a long way to go and I am loving it. Thank you Griff my friend it’s a lot of fun learning with you.